Maintain visibility and control with proven security solutions for public, private and hybrid clouds. 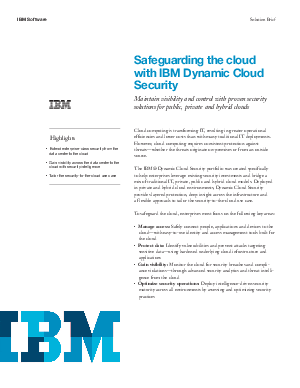 IBM Security solutions provide layered protection and deep insight across public, private and hybrid cloud environments. They help organizations manage user identities, protect data and applications, and prevent sophisticated attacks with advanced analytics.